The Wednesday League takes place at Hyndburn Leisure Centre and consists of four divisions. The Premier League is the top tier of our open age league format and is open to anybody over the age of 16. 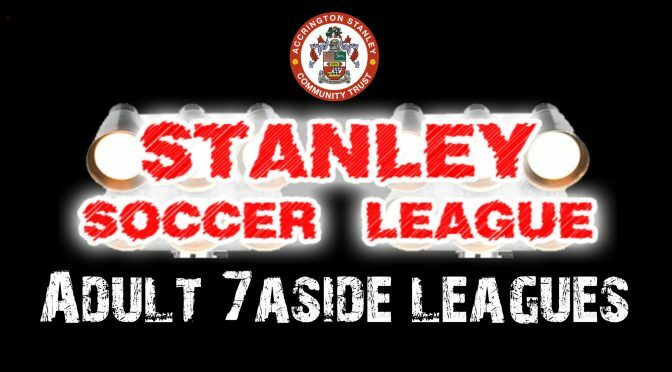 This division contains 6 teams who will compete for the league title and the accolade of Champions of the Stanley Soccer League. The games will be played on a Wednesday night with kick off times at 6:30pm. The top 2 teams in the Championship will be promoted to the Premier League and the bottom two teams from the Premier League will be relegated to the Championship Division each season. The League One Division is the third tier of our open age league format and is open to anybody over the age of 16. This division contains 6 teams with promotion to the Championship all to play for. The games will be played on a Wednesday night with kick off times at 8:00pm. Can your team work its way from the third tier of the Stanley Soccer League to the Premier League Division. The League Two Division is the fourth tier of our open age league format and is open to anybody over the age of 16. This division contains 6 teams with promotion to the League One all to play for. The games will be played on a Wednesday night with kick off times at 8.45pm. Can your team work its way from the fourth tier of the Stanley Soccer League to the Premier League Division. If your team doesn’t turn up to a fixture you will be fined your match fee of £26 and face possible expulsion from the league. If you let us know you cannot attend in advance we will try and get a replacement team to stand in for you to avoid a fine being passed on to your team. Please note there are no cancellations on the day of a game so please utilise guest players.